LAS VEGAS—One Laptop Per Child is back in the tablet race, announcing a new 7-inch tablet with the Android OS that will be sold commercially and include its learning software. The XO Tablet was announced at the International CES show in Las Vegas. OLPC will license the design to Sakar International, which will sell the tablet in the U.S. through Wal-Mart. OLPC is a nonprofit organization that focuses on creating devices to aid education of children in developing countries. The organization at last year's CES showed off its XO-3 tablet, which had an 8-inch screen and was due to ship last year, but was ultimately scrapped as the nonprofit struggled to finalize the design and find partners to make the product. However, OLPC said that some of the key technologies derived from XO-3, such as flexible power input and charging efficiency, could make it into future OLPC hardware. OLPC also said it would focus less on hardware development and more on education projects. 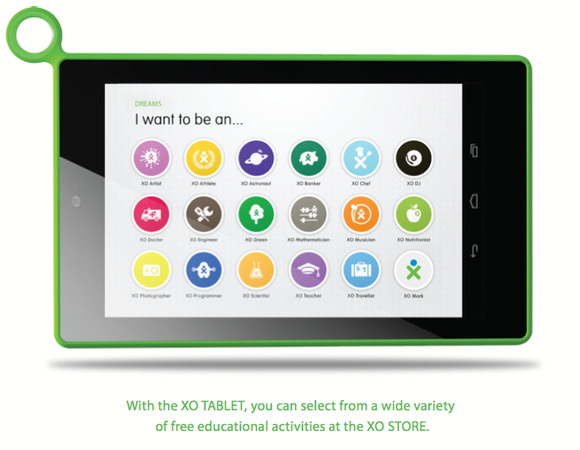 OLPC will license the XO Tablet design to device makers in other countries. The tablet will be available at Wal-Mart later this year, OLPC said in a statement. Pricing for the tablet was not immediately available. The XO-3 was initially priced at US$75, then $100, but OLPC in the past has failed to reach its targeted price for products. OLPC's first hardware, the XO-1 laptop, was also delayed and eventually shipped at double the promised $100 price tag. The XO Tablet has a dual-core processor, 1GB of RAM, Wi-Fi, 8GB of storage, a MicroSD card slot, a MicroUSB port, and front and rear cameras. The display can show images at a 1024-by-600 pixel resolution. The new tablet also has an education software package for children built on top of a version of Android. The software package includes parental controls and features to aid learning. OLPC Chairman Nicholas Negroponte has said that tablets are effective learning tools. Through its education projects, OLPC has been putting Motorola tablets in the hands of kids in developing countries and says the results have so far been positive, with children learning basic reading and writing, and even hacking into the tablets. OLPC is also open to putting third-party rugged tablets in the hands of kids. OLPC at CES is also showing its latest hybrid laptop-tablet called the XO-4 Touch, which has a screen that can swivel around and fold over the keyboard. The XO-4 resembles the original XO-1 laptop but it has a touchscreen. OLPC is also involved in the development of Sugar, a UI (user interface) for the Linux OS that provides educational tools for kids. OLPC earlier this week released the latest version of Sugar, which sports touch support for the XO-4 laptop/tablet hybrid.